Previous bike was Suzuki GSXR750K8, sold that at the beginning of April. 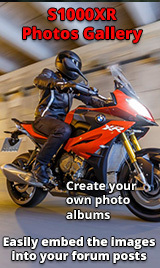 I rode a S1000XR a couple of months ago on a days' test ride. I was looking for a bike that's still engaging and fun to ride with plenty of power on demand but don't want an out and out race bike, plus wanted the convenience of having panniers etc. to be able to easily pack overnight/weekend bags and go somewhere with a lack of hassle. The S1KXR ticked all the boxes. I love the performance, the comfort and the practicality of the whole thing. Just got back from a 3 week, 5000 mile motorbike road trip in the US (west side, LA>Flagstaff>Grand Junction>Rockies NP>Yellowstone NP>Salt Lake City>Vegas (Grand Canyon NP)>Yosemite NP>Sequoia NP>LA) and now need to replace the road bike. I bit the bullet and have ordered the sport SE in red, tinted screen, with luggage and the BMW Satnav. I'm itching to get my hands on it now. Should be here in just over a week or so. Didn't get handlebar buzz on the test ride and hope it won't be a problem when mine arrives, fingers crossed. I have read about lots of very happy owners here so hope I'll join the club and be as happy as a pig in sh*t.
New to forums but I'm sure I'll pick up some useful tips. Thanks in advance. All the best. Keep it sticky side down. Oh gawd, not a red one ! Did nobody tell you the white one is the one you need ?? Welcome, Matt, and congratulations on getting the best colour. Welcome and enjoy the ride.